The Education and Skills Funding Agency has missed its own deadline to make sure new providers approved to deliver apprenticeships are up to scratch. Even though its programme director outlined the checks and balances the ESFA was planning for untested firms on the register of apprenticeship training providers in June, FE Week has learned that no firms have been visited. 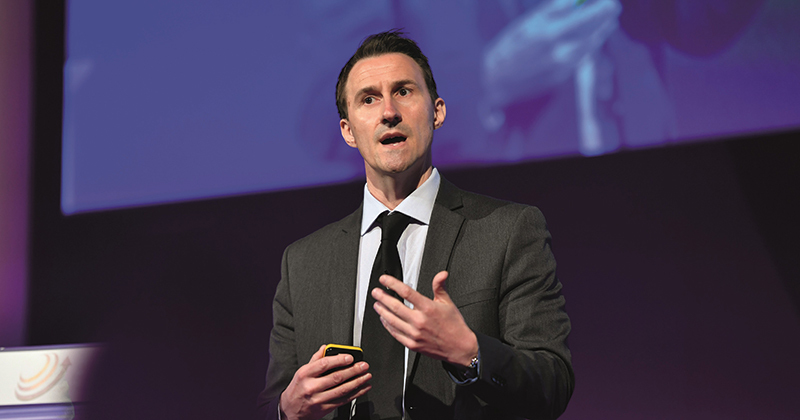 Keith Smith, director for funding and programmes at the ESFA, told delegates at the AELP’s annual conference in June that the ESFA would visit any providers which did not have prior experience of apprenticeship delivery by September. FE Week understands that no new provider has actually received a visit – even though some of them already have hundreds of apprentices. The Department for Education was criticised by the National Audit Office a year ago for sluggishness in managing risks to the system. “Past experience of market-led reform in the education and skills sector suggests that significant behavioural risks can materialise when changes are made in the market at a fast pace,” the NAO report warned, urging the DfE to “expand its work on behavioural risks” and to learn from “previous initiatives which have not turned out as planned”. The ESFA announced additional audits for new providers after a much larger number of untested firms than expected made it onto RoATP. In March we discovered that one person operating from a rented office in Cheshire had succeeded in getting three new companies onto the register. And in May a three-month-old firm with one director and an office address registered to a semi-detached house in Birmingham was added to the list. Mark Dawe, AELP’s chief executive, urged the ESFA to “keep to the commitment it made” in June. “With the future of many good specialist providers now under threat because of the recent non-levy procurement, it would be more than unfair if cowboy operators were allowed to escape under the radar,” he said. The ESFA’s presentation to the AELP conference acknowledged the sector’s concerns surrounding these new, untested providers. “I hear lots of stories about people worried about some of these new providers working out of a shed in their back garden or the living room of a property,” he said. He stressed that the register was just the “first hurdle” for untested providers, who would have to make it through a tough process of checks to keep their place. The next stage would be mandatory training, followed by visits that would “look at these organisations and to test the things that they told us when they applied to the register”. The final stage, which had been due to start this month, was to be audit visits to all new providers deemed medium- to high-risk. A DfE spokesperson refused to say whether any of the visits had gone ahead. 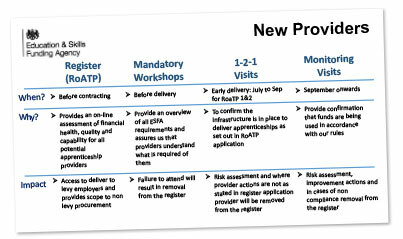 “Over the coming months we will be testing new apprenticeship training providers to ensure they are compliant with their provider agreement and funding rules,” they said.